A few days after shuttering its @facebook email service, the social network has swung an axe at its Messenger app for Windows and Firefox. In-app notifications have started informing users that the Windows desktop service will shut down on March 3. Firefox users are receiving the same end-of-support note. "We're sorry, but we can no longer support Facebook Messenger for Windows/Firefox, and it will stop working on March 3, 2014. We really appreciate you using Messenger to reach your friends, and we want to make sure you know that you can keep chatting and view all your messages on http://www.facebook.com," the message reads. Meanwhile, the link to the Windows app has been taken down on Facebook, leaving only the Android and iOS versions. There's no indication why Facebook has decided to phase out its chat client for desktop. 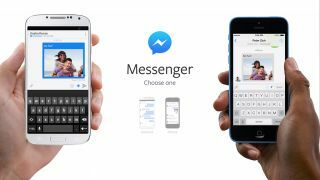 However, users won't be left without a way of chatting as they will still be able to access their messages through Facebook's website. It's likely the company is making these moves to get more visitors on the full site, move them onto mobile and earn more ad eyeballs in the process. What's more, it's likely that the apps suffered the same fate as the @facebook.com; not enough people used them. Even as Facebook phases out apps on older messaging platforms, it's diving head first into new ventures. The company recently made a $19 billion (about £11b/AU/$21b) play to acquire WhatsApp. During MWC 2014, Facebook confirmed that a standalone Messenger app will soon arrive for Windows Phone 8 devices. We've got an idea on what Facebook was thinking when it bought WhatsApp.